Please enter the search word. Our company is located in the north east part of the Kofu basin in Yamanashi Prefecture. This area is famous for fruits like grapes and peaches. It is also rich in nature and blessed with many seasonable flowering plants. All our employees want to harmonize with nature while still developing for the future. To preserve this nature “we” Enzan Factory Co. Ltd. will strive to protect the environment. Prevent environment pollution and continuously improve environment management system. We will observe the laws and regulations related to environmental conservation and also observe convention entered with community residents. We will make an effort to reduce waste in factory. We will make an effort to reduce environmental footprint by training employees therefore raising their awareness. We will publish our environmental policy and work to have a communication in and out of the company. Manufacturing factories like us consume large amounts of power. Hitherto we are depended on electricity and now we think we should contribute to the stabilization to make more electricity. 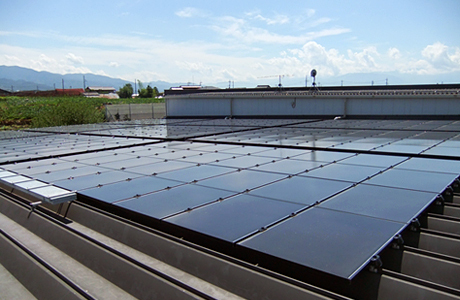 In Yamanashi, the hours of sunlight is longest in Japan and we started generating solar powers using this equipment. Below is an actual electric power generation and changes from the past. Industrial waste water which contains dusts is discharged a lot because we squirt ultra pure water during grinding and dicing wafer to cool and clean (remove dusts). We built an environment-friendly closed system that does not discharge the wastewater to rivers by filtrate industrial wastewater with ceramic filter (precision filter apparatus made from fine ceramic) and reuse this clean filtrate. We can repeatedly regenerate and reuse clogged filter for over 10 years. The filter does not become waste. 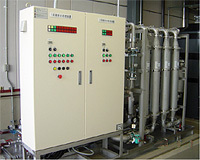 It can recover 99.9% of the processing wastewater and reuse it. It does not need chemicals such as flocculants because it filtrates with microfiltration membrane made from fine ceramics and also pore size is highly controlled. 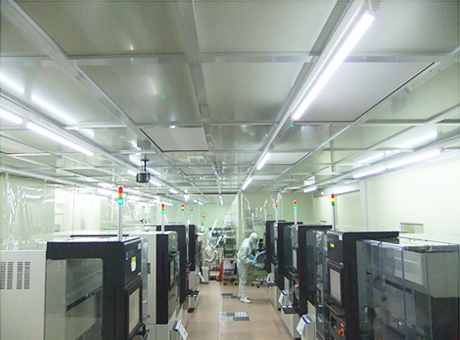 Replaced fluorescent lights to LED at both the head office and the PDM Center as one of our energy-Saving activities. We think our mission is to think about how to continue our business while being friendly to the environment and in harmony with nature for children who will lead the next generation. Total amount of electricity consumption. Easy! What is a semiconductor? Copyright 2005-2015 Enzan Factory Co,. Ltd All Rights Reserved.